Much of the history of the Tennessee Titans occurred when the team was located in Houston and known as the Oilers. However, the Titans have accomplished plenty of notable things in their own right during their brief time in Tennessee. Before visiting the upcoming Titans scheduled, here’s a look at the team’s past. The history of the Titans begins in 1960 when the Houston Oilers were one of the original members of the American Football League. The Oilers called Houston home from 1960-96 and they won the AFL title in ’60 and ’61. After merging with the NFL in 1970, the Oilers advanced to the playoffs 10 times, but they were never able to get to the Super Bowl. The Oilers announced they would be leaving Houston for Tennessee after the 1996 season, even though their new stadium wouldn’t be ready until 1999. The Oilers kept their name for their first two years in their new state, but became the Titans to coincide with moving into their new facility. Tennessee went on to pound the Jacksonville Jaguars in the AFC title game to reach the Super Bowl for the first time in franchise history. However, Tennessee suffered a heartbreaking 23-16 loss to the St. Louis Rams in Super Bowl XXXIV when wide receiver Kevin Dyson was tackled one-yard short of the end zone as time expired. In 2008, the Titans began the year 10-0 and earned a bye in the first round of the playoffs. However, they were upended by the Baltimore Ravens in the divisional round. 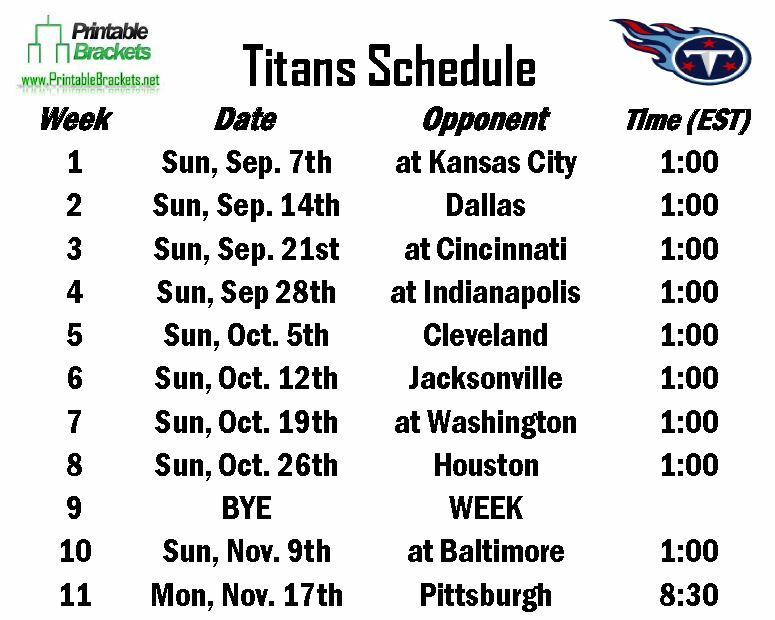 Entering 2013, the Titans haven’t been to the playoffs since. Tennessee hasn’t finished above .500 since ’08.